Correct Jig Head Weights can increase soft-bait hook-ups! Choosing the right weight jig-head makes a big difference when fishing the Twizel Canals. The most important thing to get right when fishing soft plastics is to use the correct jig head weights for the conditions and situation in which you are fishing. This rule applies equally to both saltwater and freshwater fishing. If you are fishing your soft plastic baits on a jig-head that is too light it may never sink to a depth where the fish can see your offering. Even a small difference in weight can make a big difference to your hook-up rate. Let’s take a look for a moment at fishing the hydro canals of the Mackenzie Country for trout and salmon. The name of the game when fishing the canals is to have your soft bait drift downstream in a natural fashion. When a power station starts generating electricity it will draw-off water causing the canal to flow. If the water is still, or barely moving, you might need a jig-head weighing just 1/32th of an ounce. With the water beginning to flow a change to 1/16th of once may be more effective. As the flow gains a little more pace the next size jig-head is 1/12th of an ounce. When fishing soft plastics correct jig-head weights can make a big difference to the numbers of fish that get the chance to see your offering. Ideally, you want your weight “swimming” along just above the weeds while you take-up enough slack line on your reel to keep in touch with the lure as it drifts downstream. Too much weight and all you’ll catch is the weed. Many anglers are unaware that even a slight difference in weight can make a big difference to how many fish hit your lure. If you aren’t fishing in the zone where the fish are holding you are just wasting your time! To fish soft plastic lures effectively you need a good range of jig-heads in different weights. It the fish aren’t biting experiment with more or less weight! There are optimum correct jig head weights for any situation. Just tying on the first jig-head soft-bait combo you can find in your tackle box isn’t the best way of targeting fish. Soft plastics have also proven their worth for targeting sea-run brown trout in coastal rivers. You can get some great looking 3-inch smelt (silvery) imitations in the shops that work extremely well. To fish these successfully the right weight jig-head is critical. If you don’t have a jig-head that is heavy enough try clipping on a split-shot. It works quite well for getting your lure a bit deeper. When fishing the fast water at the mouth of one of Canterbury’s braided rivers you will obviously need more weight than you might use to fish the hydro canals, however, avoid using more weight than you have too to get the lure down. Braided line is much finer than monofilament of the same breaking strain which helps your jig-head to sink more quickly. The concentrated lead-weight of the jig-head will sink faster than a zed spinner of the same weight. You may find that a 1/6th or ¼ once jig-head is sufficient even in quite fast water. Sink rate will vary depending on the size of your soft plastic shad and the river’s flow rate. 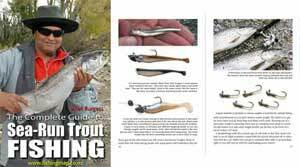 Some gear losses are inevitable when sea-run trout fishing in swiftly flowing river braids. You often only realize there is a snag once you have “hooked” it! Starting light before switching to more weight, if needed, will help to reduce the loss of jig-heads and soft plastics. Your rod and reel, braided line, soft baits, and jig-heads all form part of an integrated system when fishing soft plastic lures. In order to fish such light-weight jig heads, you need to be using a suitable rod designed to cast lighter lures. The braid is needed instead of monofilament for casting distance, and so you can feel the slightest touch on the lure. Fine diameter braid sinks much faster than monofilament. I remember fishing Mr Twister soft plastics decades ago and catching fish on them in Fiordland and the Marlborough Sounds. Back then we fished them on mono because that was all we had. Soft plastics really only took-off in New Zealand once inexpensive braided line became readily available. Don’t worry too much about the manufacturer’s stated breaking strain marked on spools of super-braid as they typically break well above this figure when tested. Try to fish a braid close to 0.15mm diameter for trout and salmon in the hydro canals because your jig-head and soft plastic will sink faster, plus you get less bow in the line as your lure swings around. The smaller diameter braid will make it easier and more effective to fish lighter jig-heads while staying in touch with the lure. An interesting development in my home city of Christchurch has been The Complete Angler fishing tackle store selling individual soft plastic jerk-shads. Instead of having to purchase a whole packet of lures the same shape and colour you can “pick and mix” in much the same way fly fishers do when choosing flies. This is a great idea! It makes it possible to try out all different colours without a huge initial outlay. By having a wide variety of lures in your tackle box you can switch over to whatever is catching fish for the bloke fishing next to you. By carrying an inexpensive selection of crimp-on leads you can quickly and easily squeeze on a little more weight to the line should you not have the correct weight jig-head. This is very effective in the hydro canals where even a small bit of extra weight can make a difference when the canal water starts moving. Salmon caught on a Gulp soft-bait from the Twizel Canals. Getting your jig-head weight right makes a big difference to your catch rate. I must admit that I prefer natural coloured soft plastic minnows when fishing for trout and salmon. Many of the shads available now are incredibly life-like in appearance. Their natural colouring complete with shimmering pearlesence is matched by their sinewy swimming action imparted by their paddle-shaped tail. They look amazingly like a real baitfish when retrieved through clear water! When sea fishing with soft plastics using the right weight jig-head makes a big difference. Too little weight and your lure won’t get down to where the fish are; usually near the bottom. Too much weight and you will constantly snag the bottom which can be costly on your wallet! If you can’t feel your lure hit the bottom now and again you are likely fishing too light. You can try winding a bit faster. Be prepared to change to heavier or lighter jig-heads if you aren’t getting bites. Also, keep in mind that when you use a really heavy jig-head for the size of the soft plastic lure it tends to deaden the swimming action. You want the lure to “flutter” rather than bore through the water like a torpedo in a dead-straight line. Getting your correct jig head weights right really matters!